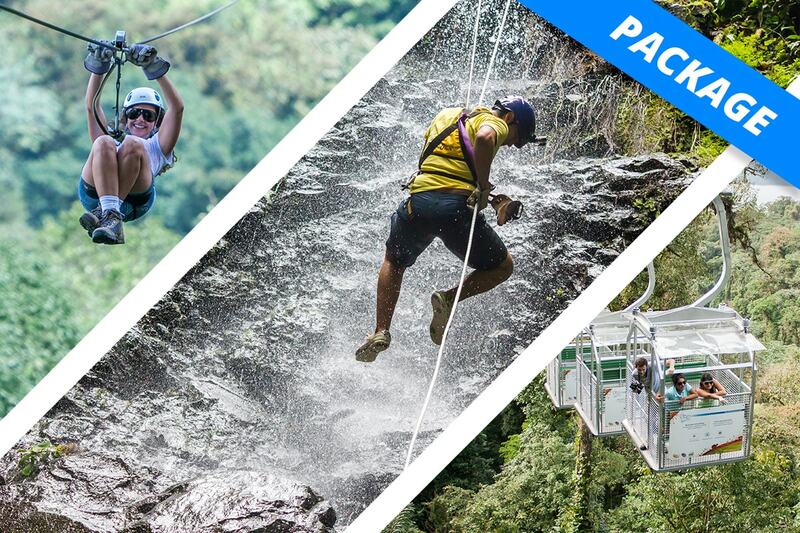 Adventure and adrenaline intense package for the most courageous explorers. If you are seeking pure adrenaline and extreme adventure this package is perfect. Feel the intense rush of adrenaline caused by flying at incredible speeds distances and heights at our unique zipline course. And after that, challenge yourself on the most adventurous tour with more than 10 activities inside the jungle. You will start riding an open-air gondola from the ground to the highest point of the mountain, discovering amazing views of the forest, Arenal volcano and much more. You will then start riding down a unique zipline circuit that stretches across canyons, going from one mountain to another. You’ll ride 7 cables that go up to 200m (328ft) in height and 750m (2460ft) in length where you will be astounded by its impressive heights, speeds, and views, like in no other place. You will then go on a high-performance circuit which begins with an ascent in our aerial tram to the highest point of the mountain where you will then start an adventure circuit consisting of twin ziplines, walking a series of tightropes, mesh bridges, descending a ladder hanging between tree platforms, hands-free descent from a tree, swing on a vine-like rope like tarzan, rappel on a waterfall, cross different Tibetan style bridges, and fly on a zipline superman style.